In response to Zappos CEO Tony Hsieh’s Downtown Project, many restaurants and eateries have emerged in the downtown area. While they may not be the high-end restaurants you will find on the Strip, these restaurants offer up Instagram-worthy meals any foodie would love. There is not a better food to enjoy after a few rounds at the bar than a nice slice of pizza. 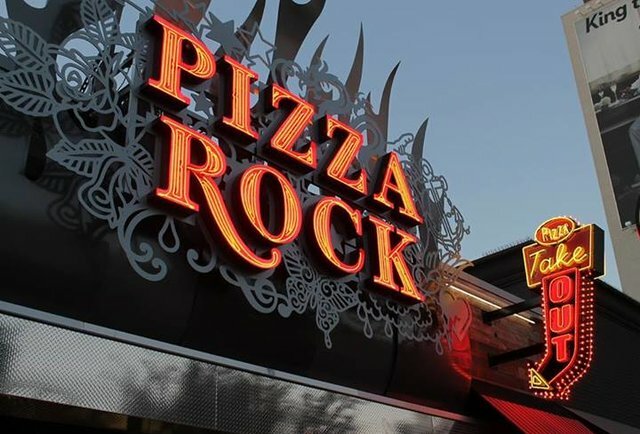 Pizza Rock, located on 201 N 3rd Street, offers gourmet style pizza that has won many awards. With their wide selections of Sicilian style to the Napoletana style, there is something here for everyone. If you are not feeling a slice of pizza, they offer up calzones, pasta and some amazing burgers. Opening just last year, this new DTLV hotspot brings a twist to American comfort food. With a different menu for lunch and dinner, be sure stop on by to try a sample of both. Even the bread served before each meal is a little different. Instead of the traditional bread, you are served pretzel bread, a great ode to the many bars in the area. On Fridays and Saturdays, you will be able to stop on by from 11 p.m. to 1 a.m. if you are looking for a late night snack. Don’t worry; we did not forget about our vegan friends. Vegenation is a place that even the biggest meat eaters will enjoy. With most of the meals, you won’t even be able to tell that there are not meat products included. Open for breakfast, lunch and dinner Vegenation utilizes local ingredients and encourages community wellness. Downtown Las Vegas has quickly become the place to be for not just locals, but tourists alike. Get a true sense of DTLV with a pub crawl from Vegas Pub Crawler. Contact us today to check availability and to book your tour of DTLV.